On behalf of the entire band, our crew, management, and those who helped to make our recent tour such a wonderful success and experience for all, we thank each and every one of you for your devotion and support. We recorded and filmed the Keswick Theatre performance. 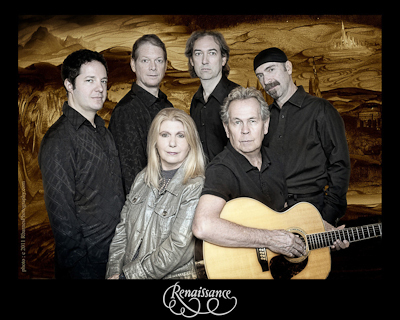 Being it all sounds and looks great, we will be releasing a CD and DVD available only through our website in time for the Holidays (along with some very special Renaissance goodies). As we now move forward with our own Renaissance, it is the loyalty and love we receive from each of you that makes this all so very worthwhile. Posted September 29th, 2011 in News, Tour. Band, crew and equipment are neatly packed up and ready to head north today as the Turn Of The Cards and Scheherazade and Other Stories tour kicks off in Vermont Saturday. Annie, Michael, Rave, Dave, Frank, and Jason are all in fine form and spirits after a very intense schedule of rehearsals. Everyone is looking forward to this run of shows and re-connecting with longtime friends and fans. Annie and Michael commented, “We wish that we could be playing for all our fans around the world, but we’ll be feeling their love every time we take to the stage. We’ve decided to record and film the shows so we can share the evening with everyone and will look forward many more shows in 2012”. Ticket sales have been great, and there are a still a few of the special VIP packages left. Posted September 9th, 2011 in News, Newsfeed, Tour.